If you like animal jewelry, then stingray pendants are a distinctive design is both attractive and evocative. The stingray shape has long been popular with jewelry designers. The flat body of the stingray translates well into jewelry design, giving designers the opportunity to create stylish pieces of jewelry in both contemporary and traditional designs. Unlike other forms of animal jewelry, stingray pendants can be highly stylized or can be true to form. The basic shape can be dressed up with gemstones for a bit of bling, formed from gold or silver for a traditional look or created with a brushed metal finish for a contemporary twist. The stingray shape is surprisingly versatile. Agalil - the stingray section of this website offers a range of stingray jewelry for sale. This includes pendants and earrings that would make a great jewelry set. 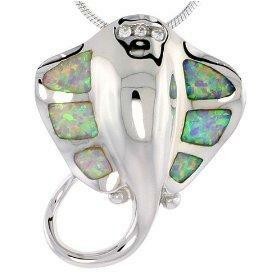 Amazon - this is one of the largest websites and contains a good selection of stingray pendants. The selection includes stingrays made from precious metals through to fun fashion jewelry items. Amazon also offers free shipping on a lot of their products. Stingray pendants will complement many dress styles. They also looks great with other stingray jewelry such as earrings or a ring. If the idea of a complete set of stingray jewelry feels over the top then consider teaming the pendant with small pearl earrings. This follows the marine feel while being more understated. A stingray pendant can also look great with gemstone earrings. Virtually any type of gemstone looks great with gold or silver jewelry. Try turquoise with gold for a stunning look or peridot with gold. Another fun variation is to create a set of animal jewelry that contains a stingray piece of jewelry. There are many different types to choose from. Keep the stingray pendant in a jewelry organizer. These have been designed to store jewelry safely and to stop chains from getting tangled which may weaken them. Regularly check the clasp. A broken clasp may result in the pendant getting lost. It is also a good idea to check the jumpring that joins the pendant to the chain. Stingray jewelry, such as pendants, make a great alternative for someone looking for distinctive jewelry.